When it comes time to expand your business, you will need a phone system to service your new employees and better serve your customers. Gone are the days of traditional landline phones – you will need a complete and robust phone system. Now they are more affordable than ever, and give you many more benefits and features for the same price or less. That’s right, we’re talking about the most common and popular form of phone system – Private Automated Branch Exchange, or PABX. What is a PABX and how does it work? PBX is a legacy technology that required the manual switching of wires by phone operators to connect calls. PABX is a form of PBX, albeit automated. It no longer needed people to connect calls to each other. Traditional PABX uses analog copper wires and maintenance can prove costly. If you require a new PABX line, it must be manually installed by a qualified technician, which has high setup costs. You must also pay line rental for each individual line, and pay standard call rates set by your carrier – costs just keep adding up! With the advancement of technology, a smart solution is to install digital PABX using Voice over IP (VoIP). This operates independently of an old-school copper wire line and can be integrated using an Ethernet or Fibre Optic internet connection. This can be a cost-effective arrangement, as outbound VoIP calls are, on average, significantly cheaper than traditional landline or PABX calls. It also allows your telephone system to expand with very few infrastructure changes. PABX systems also supports IVR, which helps customers reach the right people, take messages, reroute calls to mobile or even facilitate payments. Most importantly, it can handle many simultaneous calls and cater for multiple users. If your business grows, you simply add new extensions and increase your channels (concurrent calls) as required, dispensing with the need for extra physical lines or maintenance. Many small to medium businesses are discovering the advantages to a hosted PABX system. It is a digital PABX using VoIP, without an installation of physical servers, lines or equipment in your office or workplace. In a world where virtual offices are becoming the norm and employees or collaborators are scattered across cities, countries and even the world, a hosted PABX system is becoming a popular option. Hosted PABX uses your existing data connection to place and receive calls. You may need to purchase handsets and become a subscriber to a hosted PABX service, but the cost of entry is relatively low compared with traditional and even digital PABX. Business can ensure the quality of their PABX service by bundling their PABX with their Broadband Internet service provider. Broadband Solutions offers business PABX and Internet services together for unparalleled quality and support for both Internet and voice communications. By using the same carrier for your Voice and Data services, your carrier can provide you with a Service Level Agreement to ensure your systems are continually running 24/7. In addition to the features of a digital PABX, Broadband Solutions SmartPABX allows businesses to create up to 2000+ extensions, integrate phones with a CRM’s and accounting software such as MYOB and Xero. It can also chase overdue payments by calling customers or clients automatically. This is all achieved through an easy to use administration console, giving you flexibility and precision control over your phone system. Sound good? 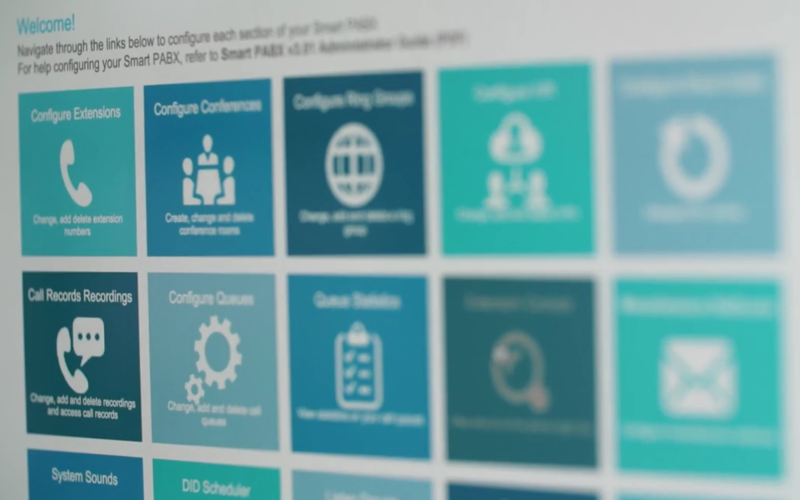 You can access the online demo of SmartPABX here. Broadband Solutions SmartPABX is a dedicated hosted PABX system that comes with 99.95% guaranteed uptime and round-the-clock technical support. Contact us about SmartPABX and other broadband Internet and VoIP solutions.